When to harvest ginger root? The best time to harvest ginger is any time after the leaves have died down. Usually it takes eight to ten months to get to that point. You can now dig up the whole plant. The reason that I grow my ginger in tubs is that it makes the harvest so easy. I don't have to dig, I just tip out the whole thing. The rhizomes that have been replanted or left in the ground don't need any water or attention until the weather warms up again. Mine still get watered where they are, and that doesn't seem to hurt them either. 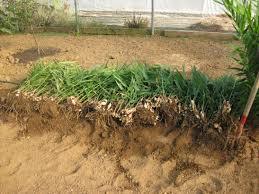 The other way to grow and harvest ginger is to have many clumps growing around your place, and to just dig up what you need, when you need it. The plants grow outwards from the mature rhizomes. Once a clump is big enough you can harvest the mature tubers without damaging new shoots. 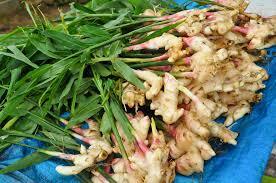 By the way, if you are serious about growing ginger at home then resist the urge to harvest it for a year or two. Rather build up a good resource stock first. I started with one little rhizome and dug it up the first time after two years. I replanted every single promising looking bud and still had some to eat. Next year I did the same, and after that I harvested enough to last me a year.